MANILA, Philippines (Released) – The results and list of passers of the April 2018 Special Civil Service Exam for Professional and Subprofessional levels or CSE-PPT including the top examinees and related announcements are released by the Civil Service Commission (CSC) few months after the eligibility exams. 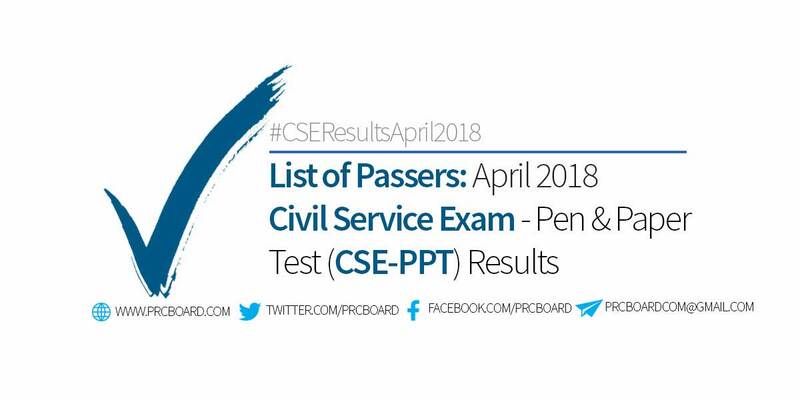 Below is the summary of April 2018 Career Service Exam - Pen and Paper Test (CSE-PPT) results for Professional and Subprofessional levels courtesy of CSC. The exams are administered by the Civil Service Commission on April 15, 2018 at CSC testing centers located in NCR, CAR, CARAGA, ARMM and designated Regional testing centers nationwide. The Civil Service Commission (CSC) said that the results for all regions are expected to be available anytime today, June 14, 2018. Meanwhile, CSC Region IV in its FB page released the list of passers for Professional and Subprofessional levels prior to posting at CSC official website. Complete lists are posted above. Keep tuning in at this article for real-time updates. The scheduled Special Career Service Examination Pen and Paper Tests are for government employees who aren't eligible yet and want to apply for permanent position or a promotion. The eligibility exams also give opportunities to employees under job order and contract of service. NCR: (For CSE-Professional level) Quezon City High School, Scout Ybardolaza Street, Sacred Heart, Q.C. ; (For CSE-SubProfessional level) Kamuning Elementary School, Scout Torillo Street, Sacred Heart, Q.C. CSC's regular conduct of the Career Service Exam, Pen and Paper Test (CSE-PPT), both for Prof and Subprof levels are scheduled twice a year to cater the growing number of examinees. Below is the next schedule of exams. To receive up-to-date news about April 2018 Civil Service Exam results, we advise our visitors to bookmark this page, visit CSC official website or follow us at our social media pages via Facebook and Twitter. within 60 days lang ba ang release date ng exam? or pwede lumagpas ng 60 days? Thankyou. Hindi na yata naasikaso tong special examination result. my result na pro d pa rin ngpopost. 60 days na wala pa din result. wag naman sa HR lang ibigay ang result kindly post it plsssssssssss. ano po ang basehan at tinawag itong special exam? gayong konti rin naman ang nakapasa at kumpara sa mga nakaraang exam ganun din naman kahirap..tsk..tsk..
special exam, dahil lang po sa schedule, consideration lang sa mga requesting parties at hindi sinabay sa regular schedule na March at August 2018. you're expecting na magiging madali ang exam dahil SPECIAL? well, mali ka po. Ang Agency na nakapasa ng List of Examinees to take CSC-PPT Oct. 14, 2018 Exam. ay may tendency na mabigyan ng chance to pass the exam?